Fits standard 2.63" body tube. Discontinued. See plastic replacement below. Fits standard 2.63" and 24mm body tube. 24mm end cored for 3/8" dowel. All parachutes are made from 1.90z. coated rip-stop nylon. Red is currently the only color stocked. Prices for standard length shock cord mounts will be added shortly. 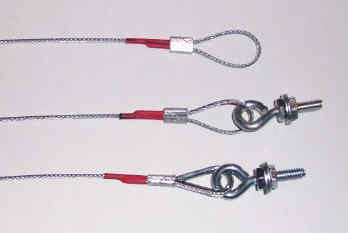 These shock cord mounts are made from 1/16" galvanized aircraft cable with a breaking strength of 480 lbs. Each end is made into a 1" long by 1/2" wide loop and secured with a ferrule. The ends are then coveed with heat shrink tubing to limit fraying. Two 1/8" holes in the centering ring on the MMT edge will allow mounting. An optional eye bolt in the loop on one end will allow mounting in a 5/32" hole in the centering ring. The eye bolt feature includes the eyebolt, two washers and two nuts. Add a thimble to one or both ends to decrease wear and tear on the loops. The picture below shows a plain end (top), eye bolt (middle) and eye bolt with thimble (bottom). A calculator for custom shock cord prices will be added soon.